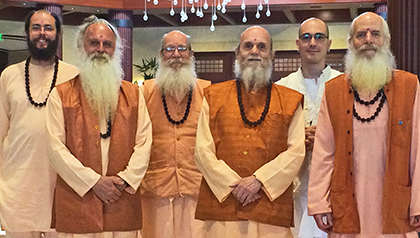 Publisher Satguru Bodhinatha Veylanswami with his team who devotedly watch over the Hindu Heritage Endowment—of which the Hinduism Today Production Fund is a part. Hinduism Today's publisher, Satguru Bodhinatha Veylanswami, thanks you "for having faithfully supported Hinduism Today during these first 35 years of its existence. “Thank you for helping its mission of disseminating Sanatana Dharma’s teachings to a hungry world. It has unfolded in just the right way—a way that the contemporary mind understands and appreciates. We are told that we have done a respectable job of it so far. Thanks again for being an invaluable part of it. “Now is a good time to take our next step and make the magazine solidly secure going into the future. The need for its contents will only grow over coming decades, and we want to be sure it is there, financially independent and fully functional to respond to the demand. “What is that next step? It is to strengthen the Hinduism Today Production Fund to the point where grants can cover all of the magazine’s production expenses. Then, it will have become financially independent. “It is a huge step. But we can take our time and reach the goal incrementally through estate gifts. When enough donors have told us that they have included the Fund in their estate plan so that their collective gifts amount to USD 5 million, then we will know the magazine’s future is solid and secure, no matter what ups and downs the world may go through. In case you have already included the Fund in your estate plan, then please do let us know, so we can add it to our ongoing tally and know that we are that much closer to the goal. Otherwise, when the time comes to make your estate plan, or revise it, please do think of our magazine and its Production Fund. Future readers will benefit immeasurably and thank you for your generosity and vision. You will have done a great service to Hinduism and to the world. There are many other good reasons to make one’s estate plan. Since you will undoubtedly want to include nonprofits in your giving, you can, with competent guidance, judiciously select which assets you will leave to your heirs and which ones to non profits. This can bring you a considerable tax advantage. And even more tax benefits accrue when you make your gifts at the time of maximum earnings. Competent professionals are available to offer guidance in these sometimes complex matters.